A survivor’s tale, The Cancer Card brims with inspiring determination. 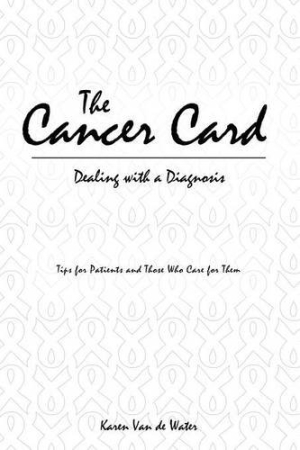 Part memoir and part how-to, The Cancer Card is Karen Van de Water’s survivor’s story, a work that uses the author’s experiences to help others. No one should have to draw the cancer card, especially a young, healthy, newly single mother of tweens. Yet many people do, and they can feel ill-equipped to handle it. The Cancer Card is Karen Van de Water’s gift to those who find themselves diagnosed with cancer and contemplating how to move forward with the hand they’ve been dealt. One snowy New England February, a pain in Karen’s left arm prompted her to go to the emergency room. While she was there, doctors discovered a tumor on her lung. Initially she was terrified the cancer had metastasized to her brain, but tests revealed it hadn’t. Karen vowed to beat lung cancer, and she credits the support of her family and friends, who often left their jobs and immediate families to take care of her, and an amazing medical team in Massachusetts with her victory. From covering the author’s diagnosis and operation to chemotherapy and recovery, chapters are linear, clearly organized, and track the author’s journey in an honest and accessible manner. An appropriate mixture of memoir and self-help book, each chapter concludes with information for the patient and her support network. Some tips are obvious (e.g., listen, eat, rest) while some advice for family and friends might be more illuminating (e.g., give lots of gifts and “do not ask how she feels”). In a book about a topic that is inherently grim, the author’s use of humor is effective and encouraging. Less effective are the historical details and factual tidbits about cancer, chemotherapy, and so on, given throughout the book; references are few and a sufficient citation procedure is not used. This is a missed gem for those interested in being empowered by locating and examining original sources. A skilled writer, the author uses analogy to help readers understand her thoughts and feelings while attempting to process life-changing information. For example, when a doctor shows her an x-ray of her lung, she describes the realization of the tumor as being comparable to a ride at Disney: “Lung Tunnel” where the adventure-seeker “drop[s] into darkness” while simultaneously discovering she is afraid. In another scene, she looks around at the other patients in the waiting room and compares them all to gladiators. The book ends with a helpful glossary. The determination to fight cancer displayed in The Cancer Card will be inspirational to cancer patients and their families.